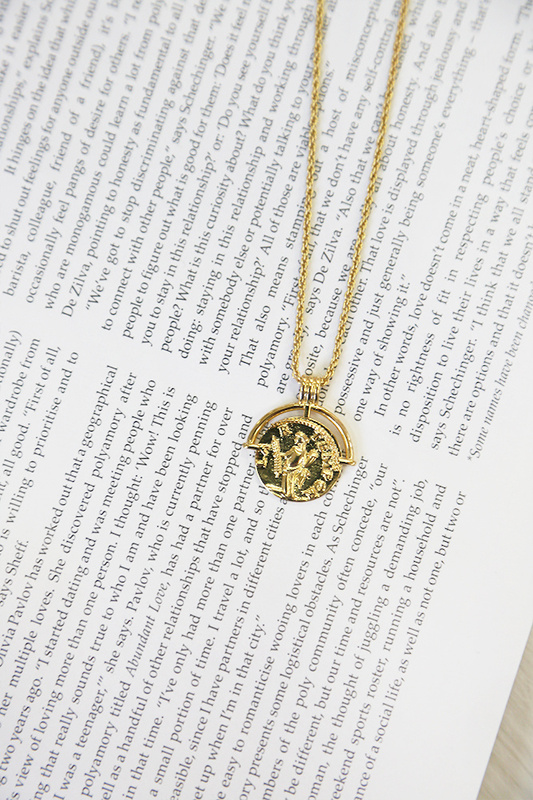 Our Your Memory Necklace features a embossed illustration on the pendant and a Parrot clasp closure. Style yours with a strapless necklace and tousled bun! We’re always on the hunt for the perfect layering style and thankfully the Free For All Choker includes three separate chains that look fab together but equally as good separately. The set includes a disk chain, a ball chain and a chain decorated wit a moon detail. We’re falling for our Catching The Moon Necklace. This style has a delicate chain with a crescent moon shape and star. Try layering yours with a choker for the look we love! The Give In To You Necklace is our go-to style when we’re planning on dressing like we’re headed to the Met Gala. It features a cross pendant and an accompanying mini oval pendant. We love wearing ours with a white tee and large gold hoops! Love to layer but don’t have enough necklaces? You’re welcome gf! Our Falling Star Necklace is a two-in-one layered piece has a parrot clasp closure and super cute charms. Complete your look with a V neck distressed tee and mini skirt!